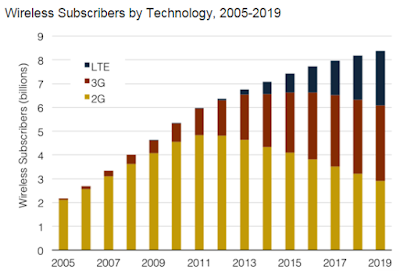 Global 4G LTE subscribers are projected to grow 35 percent compounded annually over the next five years, from 516 million to 2.3 billion, according to the latest market study by TeleGeography. LTE market penetration has been the greatest in South Korea, where the 4G technology accounted for 63 percent of wireless subscribers in 2014. Close behind South Korea is the United States market, where LTE overtook 3G as the leading mobile communications technology last year -- to account for just over half of wireless subscribers, and Japan, where LTE had a subscriber market share of 41 percent in 2014. While 4G LTE will continue to grow in each of these leading nations over the next five years to account for between 80 and 90 percent of their respective mobile subscribers, mobile networks in the rest of the world will now begin to catch up. The country to watch is China, where a boom in TD-LTE network deployment and soaring use of mobile internet access and data service usage are occurring. That said, just 8 percent of Chinese wireless subscribers were on LTE at the end of 2014. However, it's forecast to grow to 39 percent by 2019 -- at which point China will account for nearly one-third of all global LTE subscribers. Despite the ongoing rise of LTE and slowing 2G and 3G growth rates, these now legacy wireless communication standards aren’t going away anytime soon. In fact, 2G remains the dominant mobile platform today, accounting for 61 percent of all global mobile service subscribers. One of several reasons for this is that 90 percent of India’s 950 million subscribers are still connected to 2G networks. Until recently, challenges allocating spectrum resources and high 3G tariffs hampered the country's mobile infrastructure advancement. The situation is in India is improving, following reductions in 3G tariffs and increased adoption of smartphones. Moreover, India's 3G subscribers are forecast to quadruple over the next five years, but they will still account for only one-third of its mobile subscriber base. Global 3G subscribers are expected to surpass 2G subscribers in 2019, but each of these technologies will continue to account for a larger share of subscribers than LTE. According to the TeleGeography assessment, LTE is growing at a faster rate than 3G ever did. However, while 3G subscribers are declining in the U.S. and Europe markets, more new subscribers are being added in all other regions -- most notably within Africa, where they are expected to increase 19 percent compounded annually over the next five years. Therefore, despite its rapid growth, 4G LTE may not surpass 3G on a global basis until the next decade.